Kalesvara mudra calms monkey mind and soothes anxiety and irritation. The mudra, one of the ancient yoga hand gestures that links body and psyche, alludes to spiritual elements of time and of death. The formation of two hands is both a contemplation of mortality and gratitude for the gift of a human lifetime. Kalesvara also supports kicking an addiction and improving concentration and memory. 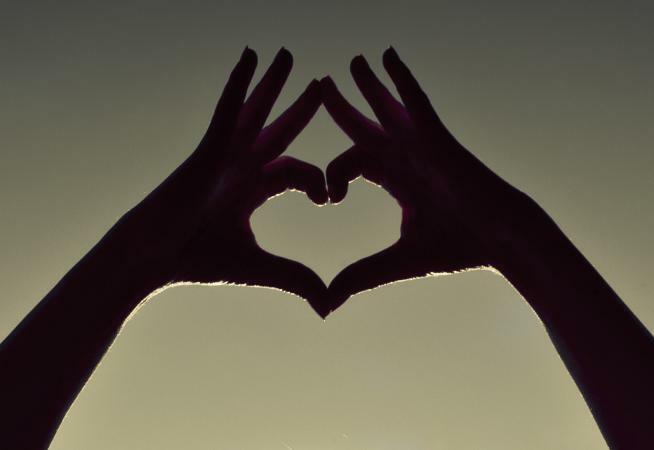 Place your hands in Kalesvara mudra to create a shape that resembles a heart -- where the index fingers and thumbs define an opening -- and a temple -- where the middle fingers tent together pointing upward. Bend your elbows and face your palms toward each other, fingers extended skyward, at mid-chest height. Touch the tips of your middle fingers together. Curve your index fingers in and down so the first joints and fingernails are touching. Gently curve the ring and pinky fingers toward each other and down but don't press them together. Point your extended thumbs toward your heart and press the pads of the thumbs together. Wing your elbows out, away from your body, and breathe in and out slowly, ten times. Pause briefly between each inhalation and exhalation to empty the mind and improve concentration. You may hold Kalesvara mudra for 20 minutes or for your entire meditation period. (Your arms may tire after a while and then you should release the pose.) After 20 minutes, breathe normally in the pose. Mudras open energy channels to the brain and clear the path for intentions to be realized. Before assuming Kalesvara mudra, form an intention -- for change or improvement -- in your mind and hold that intention as you begin the breathing practice. Allow the intention to internalize as your mind relaxes and your attention zeroes in on your in-out breathing and the pauses between. Kalesvara eases worry and leaves you refreshed as you work on reshaping your life.